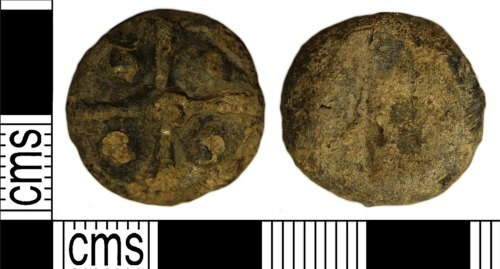 A cast lead uniface token of probable late Medieval or Post-Medieval c.1400-1600. Slightly scuffed and damaged. The obverse has a cross with a pellet in each quadrant. The reverse is plain and flat. Similar tokens are illustrated by Fletcher (2003, 40) who suggests most of the tokens such as this imitating a medieval coin, date to the 15th or 16th centuries.